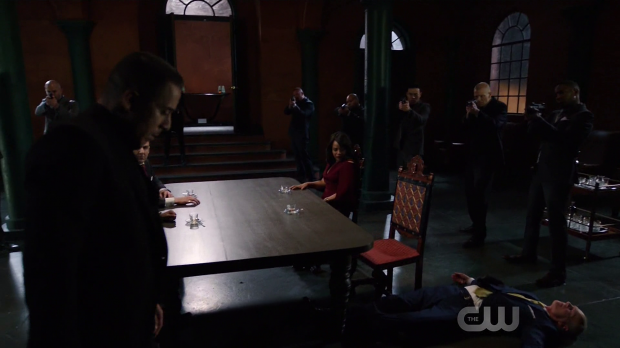 Arrow shifts its focus from the main characters to deliver some insight into Ricardo Diaz as he works to gain a seat at the top table of an influential criminal organisation. Ricardo Diaz is one of those strange sorts of villains. The reveal that he was the mastermind behind everything that this season has brought us so far came out of left field and the show hasn’t done a lot with him since. 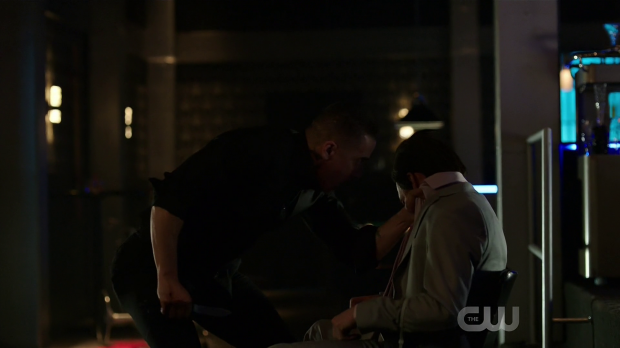 He’s certainly unique in that he doesn’t really care about the Green Arrow or Oliver Queen as he merely sees him as a nuisance that needs to be dealt with. The lack of a vendetta against Oliver is really refreshing as it puts him up against a villain that he has no history with. The flip side to that is there is very little compelling reason to invest in Ricardo Diaz because we haven’t been given a reason to. 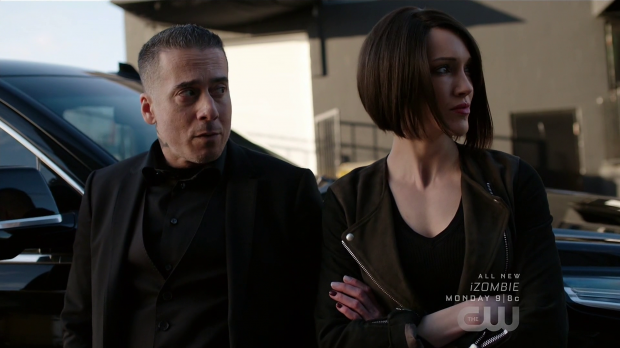 Kirk Acevedo has excellent presence and the character does things that challenge the heroes in relatively new ways but on the whole there isn’t much to him that makes him noteworthy as an antagonist for the season. This episode attempts to fix this by spending an entire episode with him. In theory this is the perfect opportunity to understand his motivations, see how he operates and learn about what makes him tick. Evil Laurel tags along to give the audience something more familiar to latch onto but her role is very much a supporting one as Diaz takes the lead. An early flashback sets the tone for Diaz and what motivates him. We see him as a child in an orphanage bullied by a more privileged kid. Diaz is weak and unable to stand up to the cruel treatment he receives so he very much takes on the role of a victim in this scenario. This sets up the thing that he spends his life trying to overcome with his past acting as the justification for him becoming strong and amassing resources so that he can be important rather than the loser he was considered back then. It’s a very simplistic motivation but also an effective one because it’s very clear and really simple to understand. Arguably a single event from such a long time ago shouldn’t really define who or what someone becomes but childhood experiences, especially negative ones can be formative and that’s clearly the case here. Now that we’re so close to the end of the season there’s no time to make Diaz’ motivations more complex than this but I really liked the simple foundation and it did feed into everything he did in this episode. Kirk Acevedo delivers a superb performance in this episode. He has used the intervening years to become detached and intelligently methodical. The subdued delivery of his dialogue as well as the quietly sinister way he conducts himself throughout characterises him as someone who has complete control of both his ego and his temper to the point that people are intimidated by him because there’s no way to predict what his next move will be since he is so difficult to read. It turns out that there’s a reason for his Dragon tattoo. It’s a representation of the fear he carries with him every day. He has always been terrified of the kid who bullied him and has managed to compartmentalise that by calling it the Dragon and tattooing it on himself as a reminder of everything he has to overcome. The fact that everyone can see it shows that he wants the image to inspire fear in others. His desire to join the criminal organisation acts as future proofing of sorts since membership is for life meaning that he will always matter to some degree. This is very important to him and intriguing from a psychological point of view. His main antagonist Cartier (Ashton Holmes) references the bully he had to deal with as a child. The way he treats Diaz mirrors that as confirmed by Diaz privately losing his temper. 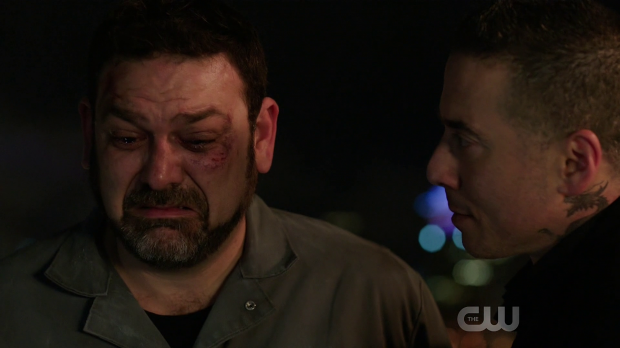 It’s a powerful moment where Diaz realises that no matter how far he’s come he still has to deal with a privileged kid who thinks his wealth gives him authority. The differences between Diaz and Cartier are highlighted very early on. It’s one of the few occasions where a thinly written character is actually a lot more effective. His condescending tone, emphasis on words like “thug”, the way he’s dressed and the on the nose dialogue in general tell the audience as well as Diaz that Cartier has never had to work a day in his life nor has he had to get his hands dirty so can’t understand what it really means to earn loyalty or respect. Diaz sees through this right away and points all of those things out to him before proving his point by easily showing him what fear feels like before killing him to send a message to his father that Diaz is not a man to be trifled with. This is weirdly contrasted by him setting fire to his bully at the end of the episode. Once again it’s wonderfully acted and it’s a satisfying moment as far as catharsis for Diaz goes but it -possibly deliberately- flies in the face of everything he did to become a measured and deliberate man who plans everything to the last detail and doesn’t let his emotions get in the way. The point of this was for Diaz to overcome the only thing that’s holding him back and dealing with Cartier would have been a reminder of the suffering he endured so could have ignited the desire to deal with it once and for all. This also shows Diaz as someone who can’t seem to let things go. It’s mentioned that Jesse (Beni Gottesman) hasn’t achieved anywhere near the wealth or influence that Diaz has which he seems to see as a badge of honour and proof that he is the better man. A better way for this to turn out would have been with something more subdued. Diaz could have approached Jesse to point out how much more he achieved and prove that he has risen above the need to get revenge because he sees Jesse as being pathetic. It would certainly be more in keeping with what has been established about Diaz in this particular episode. Another issue with this plot is that it wasn’t all that interesting to watch. Introspective reveals bout Diaz are all well and good and sorely needed but the Quadrant are an organisation that have never been mentioned before despite the apparent influence they have so it’s difficult to believe in Diaz’ need to be involved in them. Everything has to come from somewhere but this doesn’t work as an establishing episode for that organisation. I wonder if this is designed to plant the seed for them to appear on Team Arrow’s radar next season. Significant pacing issues also drag the narrative down. Evil Laurel’s presence was really engaging. As I mentioned above she mostly acts as a support figure for Diaz without much development of her own. The half baked redemption arc for her is cast aside -outside of some glances that suggest she finds the violence somewhat distasteful- in favour of her being cold and ruthless while acting as a good foil for Diaz as she doesn’t blindly accept what he says. Katie Cassidy’s performance is great and I really like the way these characters interact. I’m more or less of the opinion that Evil Laurel is beyond redemption and think that she’s far better placed as an ally for Diaz because the pair make for such an engaging team. This episode is very light on the main cast and probably should have left them out altogether. A brief subplot shows Felicity so consumed with worry about whether Oliver will make it back from his exploits as the Green Arrow. In some ways her position hasn’t changed as she was rarely in the field with him but the fact that she isn’t monitoring him from the Bunker, giving him advice and helping him with technical issues makes her feel really helpless. 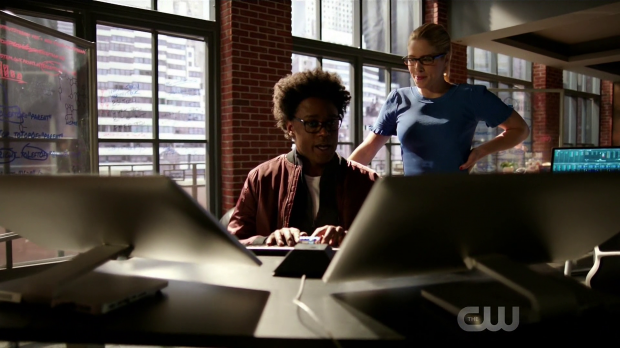 To counter this she buries herself in her work and interacts with Curtis which allows them both to put aside the team rivalries for a while and just be tech geniuses solving a problem. Curtis also reinforces how insightful he is as a friend when he acts as the voice of reason and lets Felicity vent her frustrations. Felicity feeling helpless is a really good idea as it links back to her excellent discussion with William earlier in the season where she tells him how she handles the fact that the man she loves puts himself in constant mortal danger. That discussion makes it very clear that the only way she is able to do that is by continuing to hope for the best while being aware that the worst is possible. 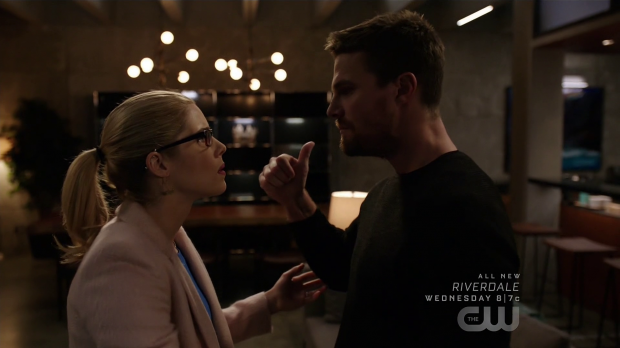 Being able to see what Oliver is doing is a big part of being able to cope with the danger he puts himself in so having that removed means that she is constantly on edge. Oliver promises her that he will always make it home even though she rightly points out that it won’t always be up to him. He acknowledges this but makes the promise anyway because he firmly believes that he can do it. Oliver has something a lot of people have; something to fight for and that helps inform his drive to succeed. Ultimately this plot could have waited but it was interesting nonetheless. A reasonable episode that provides much needed development for Ricardo Diaz. The focus is on his motivations and his attempts to become part of a criminal family where membership is a lifetime commitment. It is revealed that he was bullied as a child and is constantly trying to better himself in an attempt to prove that he has overcome that weakness. Kirk Acevedo delivers a great performance that really leads into Ricardo Diaz’ eerily calm and collected approach. He has stripped away ego and controls his temper to make him a force to be reckoned with. The antagonist Cartier is very much the opposite and Diaz holds him in contempt because he has never worked for anything or got his hands dirty. It’s one of those few examples of a thinly written character making the message associated with them come through more clearly. Diaz proves that he’s better because he’s willing to be involved and he gets his desired seat at the table. Seeing him burn his bully alive is unnecessary as a better use of that would have been achieving catharsis by Diaz realising that he is the better man and leaving it at that. This plot is somewhat problematic as there’s no reason to invest in this new criminal organisation and the development Diaz receives doesn’t appear to have anything to do with the rest of the season. It’s also an oddly paced episode that manages to be boring on occasion. Evil Laurel is used well in the episode in a supporting role. Katie Cassidy plays the part brilliantly with a cold and detached attitude helping add to her formidable persona. She makes for a good foil for Diaz as she won’t blindly accept what he says. The subplot involving Felicity was fairly unnecessary but it does link back to a great moment earlier in the season by having her feel helpless because she has no idea what Oliver is doing or whether he’s even alive. This plot also allows Curtis and Felicity to work together further showing how effective they are as a team and reinforcing how great a friend Curtis is to everyone despite the issues between the two teams. It’s not important in their business arrangement and won’t stop Curtis caring about her. He manages to provide context for her as well as an outlet for her frustrations. Oliver’s promise to always come back is acknowledged as being a difficult one to keep but it doesn’t stop him sincerely making it.